Scott Rice space planning and design team helps you create an attractive, efficient workplace environment. Our talented professionals offer innovative ideas for ways to successfully utilize your space, creating a design that complements your image and enhances your company’s productivity. We evaluate your existing furnishings, equipment and facilities. Together we identify your preferences and objectives – then we prepare solutions and present plans. Download, print and complete this furniture buyers questionnaire regarding office planning and furniture and you are already ahead of the game! Use your answers as a guide when you review your project with a Scott Rice representative. Furniture Inventory Analysis – A process that verifies your existing inventory, compares it with your objectives, and specifies what can continue to be utilized and what needs to be replaced. Computer Aided Drafting – Utilizing AutoCAD/CAP software, we produce floor plans, isometrics, elevations and installation drawings to help you visualize your new work environment. Corporate Standards Program – By establishing standards, your image is maintained – colors, signage, fabrics and styles remain consistent throughout your company. Extensive Library – Scott Rice has an extensive library of resources representing over 300 manufacturers of virtually any style of office interiors products. The library includes thousands of fabric choices, finishes and colors so that all your interiors decisions can be made in one visit. Scott Rice provides storage space and management solutions for your company’s office furniture that is temporarily and/or permanently out of circulation. In addition to our secured warehouse space, we have the experienced professionals to provide accurate asset information. When your facility needs change, our team can be an invaluable tool in finding solutions. Think of Scott Rice project management as your “one point of contact” for directing and coordinating both human and material resources. Our project management team has 47 years of experience. They act as the liaison between your company and the contractors working within your space. We help streamline communications by conveying your objectives and needs to those performing the work. We offer local and international assistance in issuing bids to contractors. Reconfiguration, Move Management and Relocation Services – We simplify the process for you by scheduling furniture inventories, space planning, and installations. We manage the entire move of furniture, special items, and people – including packing assistance and all packing materials. Total Facility Installation – From overseeing design plans and furnishing specifications, to construction and contract documentation, we ensure completion of your project to your total satisfaction – from floor to ceiling. Consulting – Our vast experience enables us to provide expert advice and suggestions to support the smooth implementation of your project. 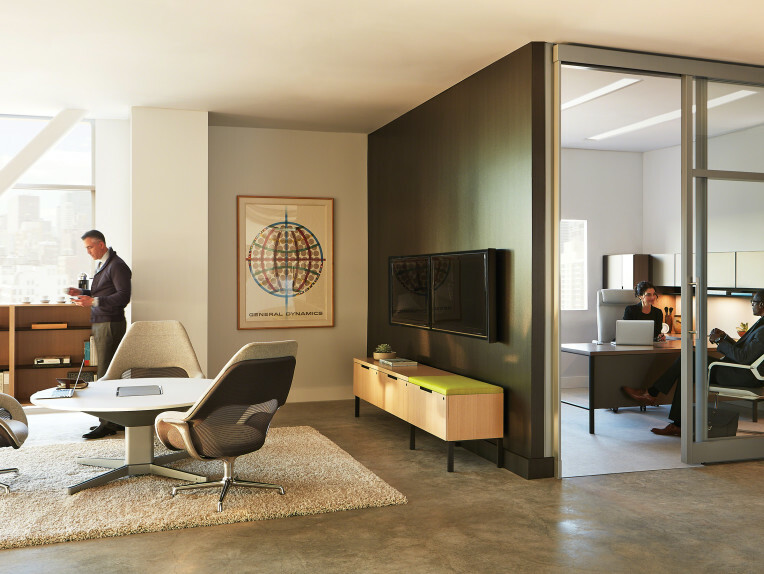 Every now and then, even the best-planned office needs tender loving care. That’s why Scott Rice offers a service and refurbishing operation. We can maintain and even enhance the original beauty and design integrity of your offices. Our specialists are trained in the maintenance and repair of furniture systems, seating, carpets – all the components of your office environment. If you want to start over with something new, we may also buy back your existing furniture. Modular System Refurbishing – Includes upholstery of panels and modification of work surfaces and panels. System parts and lamination are also available. Painting – Conventional painting of offices, as well as electrostatic painting of metal furniture can be performed on-site. Custom color matching is available. On-Site Touch-Up – Repair of scratches or nicks in both wood and metal surfaces. Custom Services – Includes furniture fabrication, glass applications and cabinetry. Upholstery – All types of seating from desk chairs to lounge seating, as well as panels. Service Maintenance Programs – Scheduled cleaning of panels, upholstered seating and carpet. We also apply fabric protectants and provide on-site service for general mechanical repair and parts replacement. Scott Rice workplace performance consulting ensures that space supports efficient and productive work processes. We help companies forecast change and strategize accommodations that uphold corporate objectives. By involving all relevant parties – architects, designers, engineers, project managers, executives and staff, our consultative approach elicits information and ideas that revitalize or reinvent physical space. Evaluation – Together we review your business issues, your culture and vision. We identify current and desired ways of working. Data Collection – Your company’s potential growth and technology requirements are determined. Job functions and departmental interaction is reviewed – space needs, individual and shared, are considered. Conceptual Planning – All information is analyzed and processed. Square footage and work setting requirements are mapped-out. Implementation – Recommendations are made that minimize square footage needs, utilizing product that adapts to technological change. The result is a distinctive workplace that evolves with the growth of your company. Don’t be a fish out of water! This extreme example represents the damaging effects of being subjected to a poor environment for an extended period of time. Bad ergonomics might not kill the affected person but it can have life-long physical repercussions and eventually kill your bottom line. Increasing company profits and supporting employee well-being are the two primary reasons to call on Scott Rice ergonomics for your office environment. OSHA reports that one dollar spent in every three spent on workers’ compensation goes for MSD (musculoskeletal disorders) – related claims. The indirect costs related to MSDs range from absenteeism and turnover, to increased human error, loss of quality and productivity, as well as, a loss of employee morale and satisfaction. We can help your company increase employee productivity and morale through corrective ergonomic action and decrease the reports, or the potential, of MSDs. Live Observation Analysis Survey: Scott Rice can offer a trained ergonomist to conduct a complete scientific ergonomic survey for each individual worker or a Scott Rice sales person can simply make recommendations based on an on-site visit. While on location, we are able to share our immediate observations and train workers in correct posture and exercise that support a more comfortable, healthier mind and body. Documented Recommendations: Our documentation is for management review and task workers reference.